Scroll down to see our list of bark & mulches with pictures!! 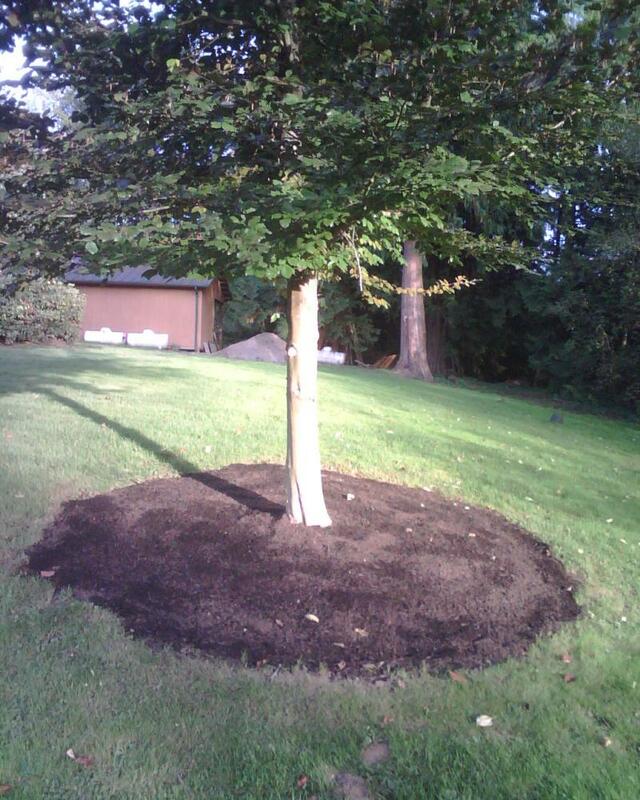 When it comes to our landscaping bark, we do not add chemicals, perfumes or color. The bark itself comes directly from the local mills where it is peeled off of Fir and Hemlock trees. No old growth trees are killed in the making of our bark. Our bark is sure to add warmth and presence to the appearance of your landscape while also insulating your plant roots from the cold in the winter as well as holding moisture in during the hot days of August. If doing large projects you will need to remember that bark color, and sometimes overall texture, may vary throughout the seasons. If color matching of barked planting beds is important to you then you should buy all the bark you need at one time. There is no guarantee that you will be able to match color when you buy bark in bulk throughout the year. Delivery to Seattle, West, South, Eastside, Bellevue, Mercer Island, Kirkland, Redmond, Newcastle, Issaquah, Sammamish, Maple Valley, Renton, Maple Valley and more. Need Weed Block? Or need a tarp to dump your bark on? We have that too. Have it delivered with your bark or mulch. Go to the Tools & Gardening Supplies page. How Much Bark Can I Get? We sell our bark by the cubic yard and we can deliver up to 25 yards at a time but if you need only one yard we can deliver that too. We do not have a minimum. How ever big or small we will do it all. We can bring bark out in smaller trucks if truck size and weight is an issue. Need Help Installing the bark? Bark Delivered and Spread: We offer bark installations as well as full landscape installations. Estimates for delivery and spreading are free if you know how much you need. If you need help figuring out how much you need we can do it for 79.00. You get 35.00 back if you go with us on the delivery or project. Please call and schedule an appointment today. For more information on services provided please see our service page. This is by far our most popular bark! Not only because it captures the look most people are thinking of when wanting a medium bark but also because of the great pricing we have on it. This bark was used at the Federation State Park in summer of 2010. Size (3 inches down to dust): Our medium bark is approx. 3 inches on down to dust. Saying this bark is up to 3 inches in size does not mean there will be 3 inch diameter chunks of bark. You will find our medium bark on the finer side with strands of bark up to 3 inches in size. If you are looking for the big chunks of bark then you will want to check out our pricing for our bulk nugget bark (see farther below). Color: Our medium bark is an eye pleasing reddish brown in color. It is seldom the bright red color that most people seem to avoid. We also offer a medium dark mulch with bark as well (No picture of the dark medium is listed yet). Benefits: This bark is often used in winter for insulating the ground to protect roots of plants and also in the dry heat of summer to help hold moisture in the soil. While some people claim bark to be a great soil amendment there will be a lot of professionals who will disagree on this. Bark uses up nitrogen in the soil as it decomposes. As with any bark product, unless it is mixed with compost (see our bark/compost mix farther below) you might consider putting a good fertilizer around your trees and shrubs prior to laying bark. If deciding on fertilizers then follow directions on fertilizer package. How long will medium bark last? Medium bark will last up to 2 to 5 years depending on how thick you put it down and on weather conditions. The number one cause of medium bark loss is raking up leaves on bark areas. Because there are larger 3 inch strands of bark the metal or plastic rake tines will pull out and pick up the bark pieces. If the bark is being used in high maintenance areas then you might want to consider fine bark as it will be more difficult to pick up with the rakes. Size: This bark is 1 ½ inches down to dust. Benefits: Our fine bark is often sought by realtors and homeowners when beautifying a landscape of a home that is up for sale. Our fine bark is also popular with a large following of people preparing landscapes for upcoming weddings or other social events. Because it is finer in appearance it can help give any landscape a clean, pristine look. Like the medium bark, the fine bark is often used in winter for insulating the ground to protect roots of plants and also in the dry heat of summer to help hold moisture in the soil. While some people claim bark to be a great soil amendment there will be a lot of professionals who will disagree on this. Bark uses up nitrogen in the soil as it decomposes. As with any bark product, unless it is mixed with compost (see our bark/compost mix farther below) you might consider putting a good fertilizer around your trees and shrubs prior to laying bark. If deciding on fertilizer then follow the directions on the package. How long will fine bark last? Fine bark can usually last because 1 to 4 years depending on how thick you put it down and on weather conditions. Because fine bark is made up of really small pieces of bark it will decompose quicker. It is a better bark to use in areas where there will be a lot of leaf raking going on because the leaf rakes will not pull this bark up as easily. Size: 1 1/2 inch down to dust. Benefits: It has a really nice black color that tends to stay and not fade out. There are many who feel that composted bark mulch is a lot less harsh on the plants in a landscape then newer or fresher bark that is red in color. Also, many people in homes with lots of trees and shrubs find the darker bark to give the landscape a more natural feel as opposed to a bark that is more red in color. This particular mulch has really proved to be a favorite. One caution to this product is that it will not keep the weeds at bay as good as non composted barks. If the primary reason for wanting bark is to keep weeds down then consider the medium bark first. How long will it last? It can last up to 2 years or more if in the right conditions but usually only up to a year or two if in heavily shaded areas with lots of leaves dropping down on top. Booster Blend provides gardens with the finest blend of Cedar Grove Compost and washed dairy manure. The washed dairy manure is collected in a confined feedstock operation, offering a high input control for potential weed seeds that might be found in other manure sources. Cedar Grove Booster Blend is registered organic and approved under the Washington State Department of Agriculture Food Program. For more information on the Booster Blend Mix click here or click on the icon. Size: 3 inch strand and nugget bark. Benefits: It has its own special look. This is usually the same kind of bark you will find in bags at the hardware store though this bark has more shards of bark and wood then in what would be considered a true nugget bark. It can be kind of confusing because the bags wont really clarify if the bark is nugget or not. Nevertheless, its usually way cheaper to buy it delivered in bulk than by the bag. 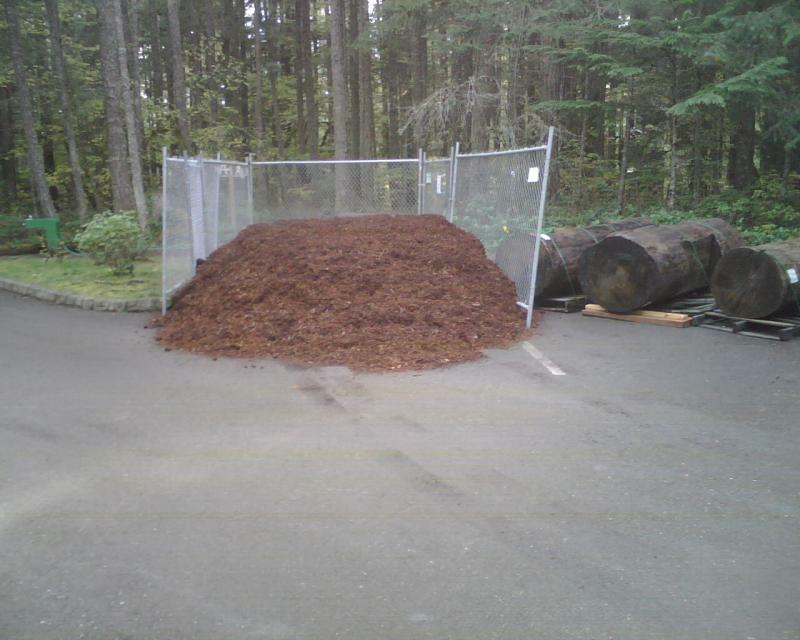 Another good reason to buy in bulk delivered is there is no plastic bag waste that is left from buying all those bags, as it can take 27 one-cubic-foot bags to make a yard of bark. How long does it last? It lasts a really long time due to the large pieces that take so long to break down. The larger pieces can be a downfall if you have lots of leaves dropping that then get caught up in the rake when cleaning up the leaves. Size: 3/4 inch down to dust. This stuff is pretty fine. It’s hard to find 3/4 inch pieces in this stuff but there will be some. Benefits: It has a really nice black color that tends to stay and not fade out. Because there is steer-manure in this it will actually help plants to green up. It might not be as beneficial at the Cedar Grove Compost when it comes to that but people do swear by this product. How long will it last? It can last up to 3 years or more if in the right conditions but usually only up to a year or two if in heavily shaded areas with lots of leaves dropping down on top. Size: Approx. 1 to 2 inches. We can only haul 20 yards or less of this product at a time. Benefits: Like the coarse bark this has its own special look except it does not have near the amount of coarse strands of bark that the coarse bark does. It is usually reddish brown in color. The nugget bark can help give a landscape a "Formal" or "Tailored" look because, although it looks nice, it is not a natural look to the northwest area. It looks especially nice in large concrete bordered areas with large open bottom shrubs. Some even like to use it to improve the contrast of soil areas around water features. How long does it last? Like the coarse bark a really long time. But don't use it in areas where lots of raking will be needed to clean up leaves and other such debris. The 3 inch nugget pieces are so big you can often use a blower to blow away leaves without removing the larger pieces of bark. Size: Approx. 2 to 3 inches. We can only haul 20 yards or less of this product at a time. Want A Price On Bark?